MedicalResearch.com: What are the main findings? Are smartphone apps useful in the self-diagnosis of skin cancer? Response: We found that visual inspection using the naked eye alone is not good enough and skin cancers may be missed. For studies clearly conducted in a primary care setting where study participants were essentially consulting a medical professional with a suspicious skin lesion for the first time, on average up to one in 10 melanomas could be missed. For studies conducted in referral settings, where study participants had been referred for a second opinion due to some prior suspicion of melanoma, at least 2 in 10 melanomas might be missed. We think that these differences are likely because specialists are likely to see a higher proportion of skin lesions that are more difficult to diagnose, but also because primary care practitioners have a lower threshold for identifying suspicious skin lesions as possible melanomas and so are likely to refer the majority of people who do actually have melanoma for a second opinion. This lower threshold comes at a cost of over-referral of benign lesions putting pressure on specialist services. 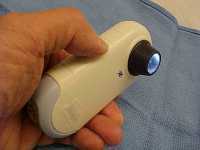 Overall, the use of dermoscopy led to a fourfold increase in accuracy for diagnosing melanoma. The majority of available research was carried out referral settings by specialist clinicians so that we couldn’t clearly estimate how much dermoscopy adds when used in different settings. On average, however, if we assumed the same false positive rate for both visual inspection alone and visual inspection plus dermoscopy (assuming 20% of benign skin lesions are incorrectly diagnosed as melanoma), the use of dermoscopy would increase the correct detection of melanoma (sensitivity) from 76% for visual inspection alone to 95% with dermoscopy. A number of other technologies were evaluated in the other reviews in our series, however there is not yet enough evidence to recommend widespread adoption in different healthcare settings. On the current evidence base we would strongly advise against the use of smartphone apps by people with worries about new or changing skin lesions as they run a high likelihood of missing melanomas. Response: When used by physicians who are experienced in skin cancer diagnosis, dermoscopy increases the detection of melanomas. At the end of the day however, unless a biopsy is carried out, there is no perfectly accurate test for detecting skin cancer and so anyone who gets a benign diagnosis from their health care provider and who later has continuing concerns about a particular skin lesion should always go back for a second opinion. Response: Too much test accuracy research has been conducted using images of skin lesions rather than face-to-face consultations and using selective populations, especially those including only skin lesions that were eventually biopsied or excised. This makes it really difficult to generalise results to the wider population of people with different lesion types that might be seen in primary care or even in a secondary care setting. It is really important that diagnostic tests are evaluated in the same types of people that the test will be used on in clinical practice rather than trying to transfer results from one setting to another. We would like to see further research on the use of dermoscopy in primary care in order to identify how well it performs in terms of melanoma detection and to identify the level of training needed to recommend its widespread use. Dec 11, 2018 @ 7:17 pmThe information on MedicalResearch.com is provided for educational purposes only, and is in no way intended to diagnose, cure, or treat any medical or other condition. Always seek the advice of your physician or other qualified health and ask your doctor any questions you may have regarding a medical condition. In addition to all other limitations and disclaimers in this agreement, service provider and its third party providers disclaim any liability or loss in connection with the content provided on this website. This entry was posted in Author Interviews and tagged dermatology, JAMA, melanoma, skin cancer, unibirmingham by Marie Benz MD FAAD. Bookmark the permalink.